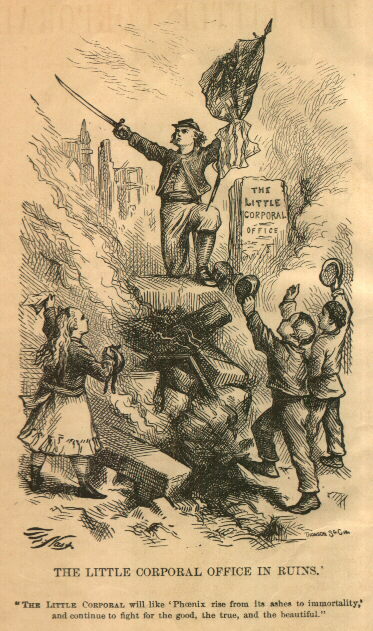 The offices of The Little Corporal were completely destroyed in the Chicago Fire of 1871; nevertheless, in November, the magazine editors managed to send out an abbreviated issue to subscribers, assuring them that the Corporal was still in business. Thomas Nast’s tribute to such determination appeared in December 1871; it features subscribers cheering the stalwart Corporal in the smoking ashes and rubble of Chicago. Nast worked primarily for Harper’s; his jovial, rotund, toy-bearing Santa Claus had a major influence on the Americanization of that figure. (He did illustrate for at least one other children’s magazine, the short-lived Little-Pig Monthly.) The imaginary “army of friends” mentioned in the piece included “Prudy,” the figure at the head of the letters column, and “Private Queer,” whose “knapsack” contained the puzzles and enigmas the Corporal’s readers loved. THE LITTLE CORPORAL OFFICE IN RUINS. A few days after the great fire we received a letter from Thomas Nast, the great artist, whose inimitable sketches in Harper’s Weekly are familiar to all, stating that he had sent us a drawing, the subject of which would be timely and apropos for the first number after the fire. He desired us to accept this as his donation to aid in restoring the Corporal. The Corporal, Prudy, Private Queer, and all others of the Corporal’s army of friends, hereby express their thanks to Thomas Nast for his generous and timely gift.